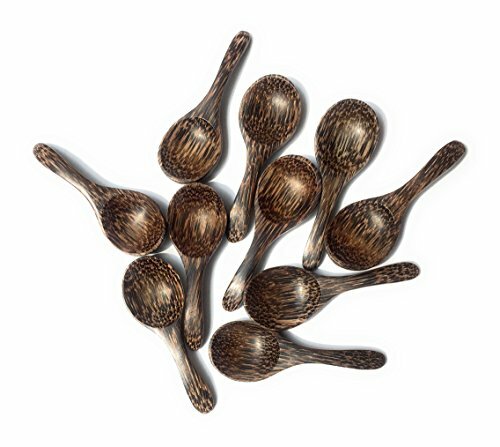 WD- Thai Natural Palm Wood Small Spoons Sugar Seasoning Salt Spoons for utensil home kitchen and coffee Set of 10 x 3"
Whether you're looking for a gift to give or a gift for yourself; whether you're looking for something for special occasions or every day use, ,br>WD store Thailand product is an exceptional choice- the exquisite craftsmanship, gorgeous color and natural design will make a special occasion out of any occasion Our product also means "easy care". Hand wash with warm soapy water and air dry.
. It doesn't typically require oil but, if for some reason it appears to be drying out, simply use a non-toxic mineral oil to restore the wood grain to its original beauty. Package dimension :5.5" x3.8" x 2.3"
Eco-friendly not lacker made from natural Palm wood durable and smooth. They are beautiful of fish Palm wooden spoon.And great for using everyday in you home restaurant.